Are so many taxi journeys really needed? Many streets in Waterloo (such as The Cut) swarm with taxis, frequently making their empty way to the station and I wonder why so many space wasting, air polluting vehicles are needed. Especially on a sunny day like today when a burst water main has caused major congestion in the area. I decided to spend half an hour between 5.10 and 5.40 pm looking at people walk up to and get into cabs at the Waterloo station rank. The line of cabs stretched back from the rank as usual, round the corner and down to the mini roundabout on Spur Road. The drivers kept their cabs' diesel engines running even though they were stationary for minutes at times - certainly long enough to read an article or two in a paper. Given the high temperatures, the price of fuel, and the harm that the emissions cause to people and the planet I'm amazed the drivers don't switch their engines off while stationary. Within those 39 taxis there may be people for whom a tube or bus and/or a short walk is not feasible, but I'm guessing that for the great majority it was just a choice, and I'm interested in how they could be persuaded not to choose to take a congesting, polluting taxi. None of the people looked in a desperate hurry. Some were clearly tourists and some people seemed habitual taxi users here. 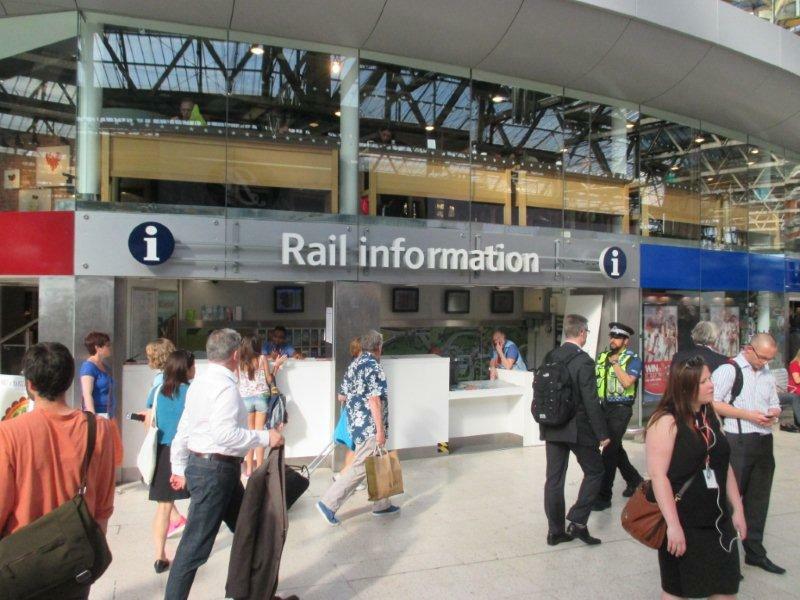 For the tourists a carefully positioned desk and interception on the approach to the taxi rank by an official Travel Adviser (similar to the inmidtown scheme) may switch many people to a tube, bus, walk or cycle hire. I think such a scheme should be trialed by TfL or the local borough(s) as a congestion busting measure, though I am aware that it flies in the face of a capitalist system that doesn't expect entrepreneurs such as taxi drivers to pay the full external costs of their business. 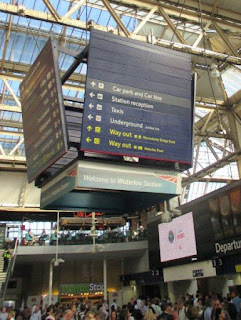 That thought led me to consider how the public transport system is sold here currently - I hope, firstly, that Oyster cards are promoted and sold on the Gatwick Express and other services from airports and ports, with onward public transport advice available - including promotion of relevant apps etc. Taxis and Cars are prominently placed; Buses and Travel Information are non-existent. There is no Travel Information or Tourist Information desk at Waterloo. 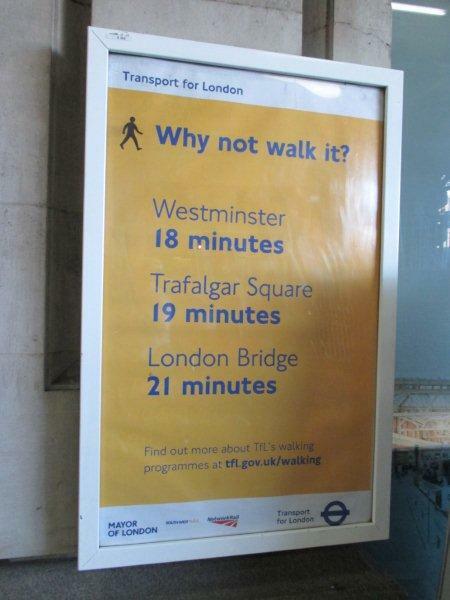 You go to Victoria for the former, Leicester Square for the latter. There is however a Rail Information desk - hardly an intuitive place as you leave a railway station to seek bus information, and indeed no bus maps etc. are available there, though a tube map is. 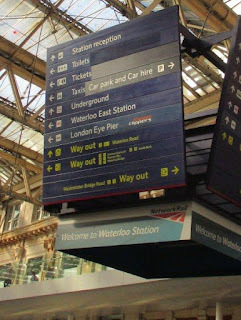 Tourists may well prefer to use an Oyster card rather than try swiping a debit card, but an Oyster card cannot be bought here - you have to go down the escalator to the tube station to buy an Oyster card then come back up to exit the station to catch your bus. 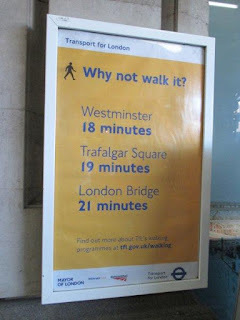 On the approach to the cab rank there is currently this poster on the wall, but is a lengthy walk really the preferred option for someone with a compact wheeled case - and anyway, where's the accompanying map or Legible London signpost? A public transport map board with an Oyster card machine also seem sensible options to have just by the taxi rank, though I think a Travel Adviser is also needed to really sell more civilized options than city clogging, belching taxis for people leaving the station. Finding a way to switch even as little as 10% of taxi journeys in London to smarter modes would make such a difference in the centre of London. Let's hope a way can be found to do it.